CA7 is a product of Computer Associates and is a scheduling tool for batch jobs in mainframe.When the number of jobs to be executed is huge in number and jobs need to be executed depending on several parameters (like time dependency, availability of data sets from other jobs, successful completion of other jobs), a tool like CA7 comes into play. Once a job is scheduled /triggered or manually added in CA7, it will start a process of moving through various QUEUES in CA7. CA7 will manage it until its completion. 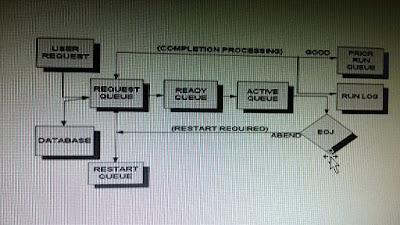 Below is the diagram which shows in brief the lifecyle of the job inside a CA7 Scheduler. 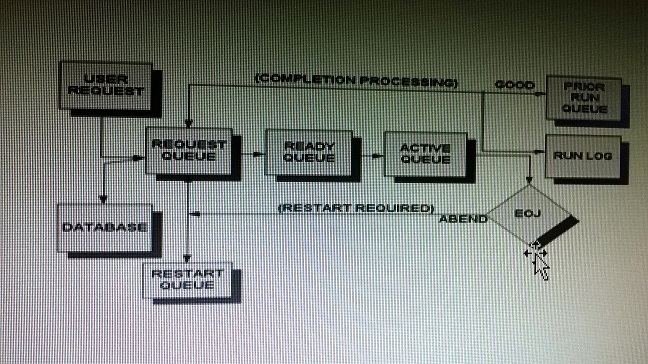 Ready Queue: When a job's requirement have been satisfied, it will move to the ready queue. It will wait until initiators are available and any virtual resource or workload manager requirement is satisfied to enable it to execute. Active Queue: When job can run it is moved to the active Q where it will remain whilst the job is executing within JES2. Once the job has completed successfully on JES2 the job will be marked completed within CA7 and is removed from the active Q. Failure list: If the job fails the it will be moved back to the requirement queue but will need correction prior to rerun. JCL errors are returned to ready Q and other failures are moved to request Q. How to login to CA7. Differnet systems use different methods to get into CA7. Some system allow the users to access the CA7 from ISPF menu while others use varied methods. Once we go inside the interface all remains the same. Refer to This link for list of CA7 Commands. MaxMunus Offer World Class Virtual Instructor led training on TECHNOLOGY. We have industry expert trainer. We provide Training Material and Software Support. MaxMunus has successfully conducted 1,00,000 + trainings in India, USA, UK, Australlia, Switzerland, Qatar, Saudi Arabia, Bangladesh, Bahrain and UAE etc.